‘Modern’ theories of the Phillips curve inadvertently imply that inflation is an integrated or near-integrated process, but this implication is strongly rejected using US data. Alternatively, if we assume that inflation is a stationary process around a shifting mean (due to changes in monetary policy), then any estimate of long-run relationships in the data will suffer from a ‘small-sample’ problem as there are too few stationary inflation ‘regimes’. 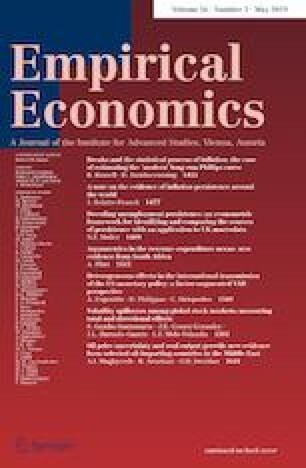 Using the extensive literature on identification of structural breaks, we identify inflation regimes which are used in turn to estimate with panel data techniques the US long-run Phillips curve. We thank Tom Doan for generously making available the Bai–Perron programmes on the Estima website. All data are available at http://billrussell.info. The US data are seasonally adjusted and quarterly for the period March 1960 to June 2015. The US national accounts data are from the National Income and Product Account (NIPA) tables from the USA, Bureau of Economic Analysis (BEA) and downloaded on 2 and 3 September 2015 except for Table 1.1.6 which was downloaded on 21 November. The database is available at www.BillRussell.info.